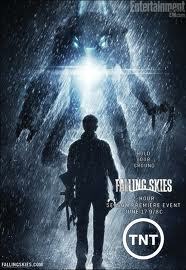 TNT’s alien invasion series Falling Skies had its two-hour Season 2 premiere this past Sunday and its numbers were down from where it was with its series premiere last Summer. It pulled a 1.5 rating in the 18-49 demographic and 4.5 million total viewers versus the 2.0 rating and close to six million total viewers it had with last year’s bow. But then this past Sunday’s numbers were about where the show was when it ended its first season and it was the third most watched cable show on Sunday. And the show’s ratings are more than double what the typical Syfy scripted series pulls, so Falling Skies should be safe for now. The most watched cable show on Sunday was again HBO’s True Blood which had a 2.6 rating and 4.4 million total viewers. That’s down from the 2.9 rating the show had for its Season 2 premiere, but still very good numbers for a premium cable series. And on Monday night, MTV’s Teen Wolf remained steady, pulling a 0.7 ratings and 1.7 million total viewers, right in line with what it has been averaging so far. You can see the Cancellation Alert status of all the shows currently airing plus the final results from prior seasons at my Cancellation Watch page.